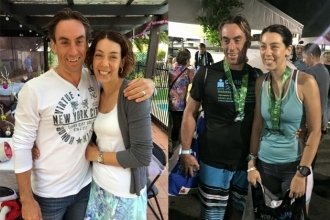 When I announced that Hamilton Island Triathlon was going to be my first sprint distance, I generally got two responses: “Nice choice — that’s one of the most picturesque courses you can do!”, or “Wow — that’s a hard one to start with!”. After doing Hamo at the weekend and officially becoming a ‘triathlete’, I’m inclined to agree with both, and will happily say that the experience was right up there with one of the best of this year — as much for the race, as well as the recovery and ‘tri-cation’ afterwards. 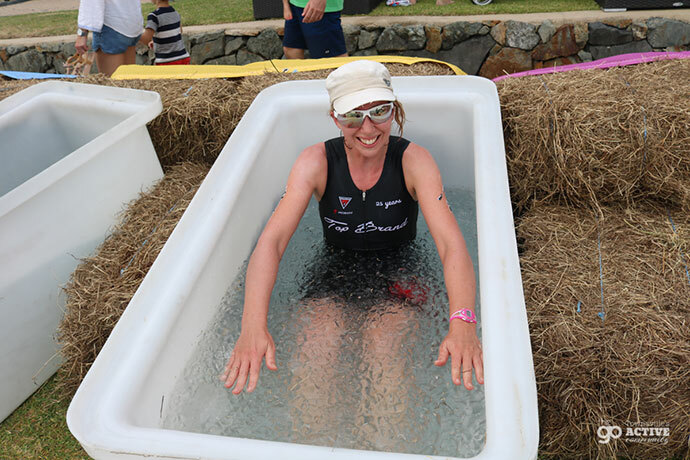 Perhaps the least enjoyable experience of the weekend – the ice bath! 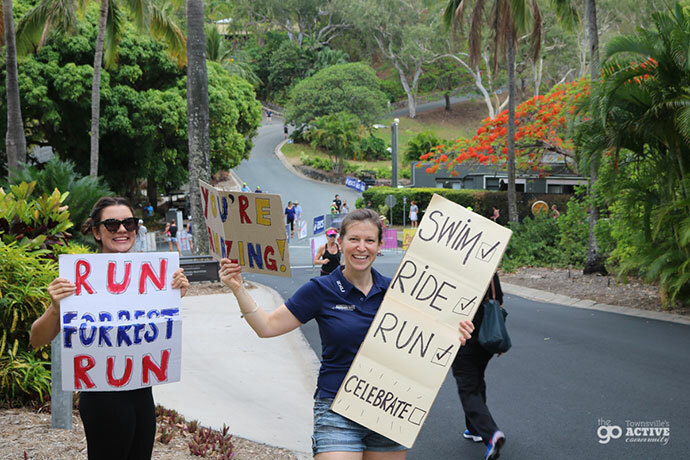 Hamilton Island Triathlon was a sell-out event for the first time this year at 250 individuals and 30 teams, with athletes travelling from as near as Townsville and other parts of North Queensland, to as far as WA and even Colombia to take part. 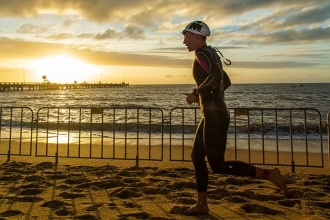 There were the likes of five-time Ironman World Champion Craig Alexander, Olympic swimming legend Susie O’Neill (AKA Madame Butterfly), and professional triathletes and Rio Olympics-hopefuls Grace Musgrove, Jake Birtwhistle and Emma Jackson racing alongside some people who had never swum until months ago. This, combined with the excitement and the vibe of being on such a beautiful tropical island, made the atmosphere electric. Local athletes, including Donna Dowling (left), racing along-side overall winner and Olympic hopefully Jake Birtwhistle. They shut the airport for you to ride on the runway. Need we say more? Where else does that happen in the world? 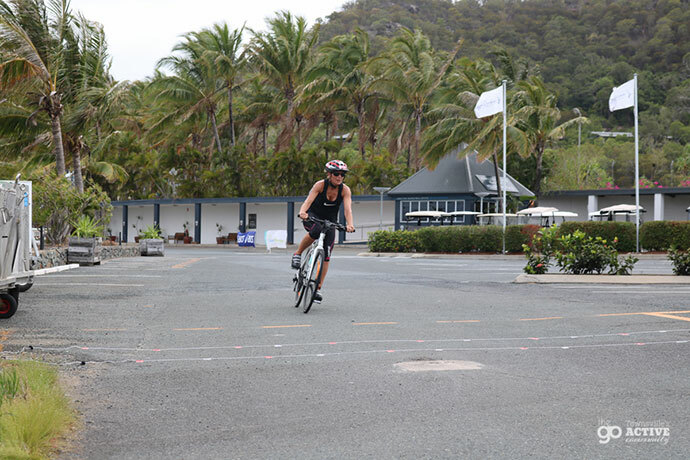 Hamilton Island airport comes to a standstill as about 280 bikes belt around the tarmac. Well, to be fair, they belt around half of it — the other half is straight into a headwind — great for planes taking off; not so great for the legs, but that’s part of the fun of it (insert grimace)! The entrance to the airport section. Pete Murray says, “No bullsh*t”, it’s one of the best locations in the world”. 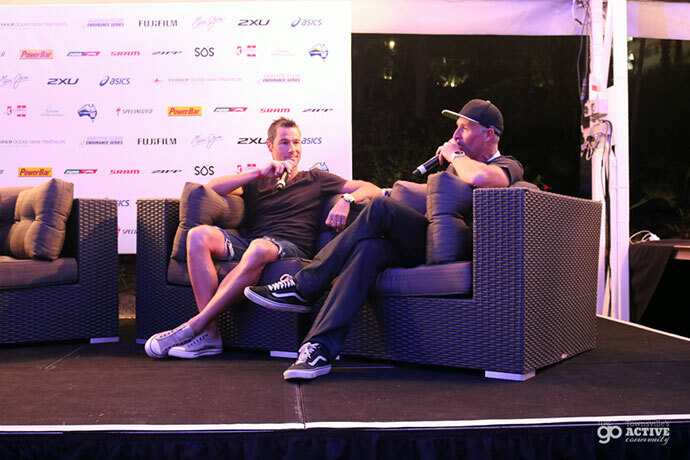 Seeing as one of Australia’s leading commentators and ‘the voice of Ironman Asia Pacific’ Pete Murray travels all over the globe to welcome home thousands of Ironman athletes a year, you could say he’s seen some breathtaking locations and experienced some brilliant racing atmospheres. He is also known for not beating around the bush, so when he says Hamo is one of the best in the world, we trust his opinion. Not a bad looking swim start. Rub shoulders with Australia’s sporting who’s-who. Athletes like five-time Ironman Champion Craig Alexander (three-time Ironman and two-time Ironman 70.3), Olympic swimming legend Susie O’Neill, and young professional triathletes and Rio Olympics-hopefuls Grace Musgrove, Jake Birtwhistle and Emma Jackson not only do this event with you side-by-side (OK, maybe not for long…); but they are there the whole weekend hanging out and are totally approachable (and open to high-fives and selfies if you are that way inclined!). Me with Susie O’Neill. Should have asked for some swimming tips! It was great hearing from them in the Carbs on the Couch dinner, particularly when Pete Murray interviewed Susie O’Neill and Craig Alexander. It’s easy to forget that these mega athletes all have the same self-doubt as the rest of us and are actually normal humans outside of their sporting achievements. 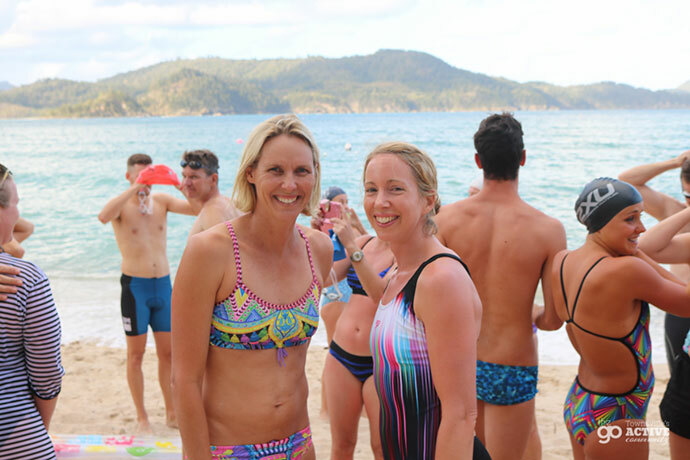 They had some great race tips to share too (like Susie’s ‘long and strong’ during the swim, and Craig’s reminder to race your own race — not focus on what anyone else is doing). Pete Murray interviews Craig Alexander as part of ‘Carbs on the Couch’. Take advantage of the weekend of active events. 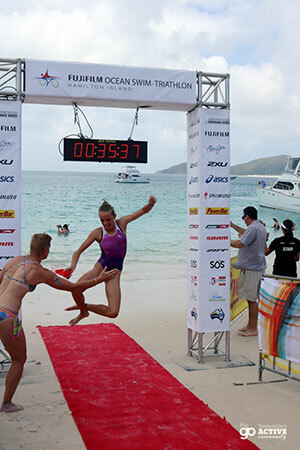 Whitehaven Beach Ocean Swim 750m winner Emma Hogan. If you think you are coming for a couple of hours of racing on Saturday, think again. The active festivities start Friday and run all weekend, concluding with the Dent Dash on Monday — a social walk or run over part of neighbouring Dent Island’s Championship Golf Course. Choose from 4.5km, 6km or 10km and then enjoy breakfast in the clubhouse. 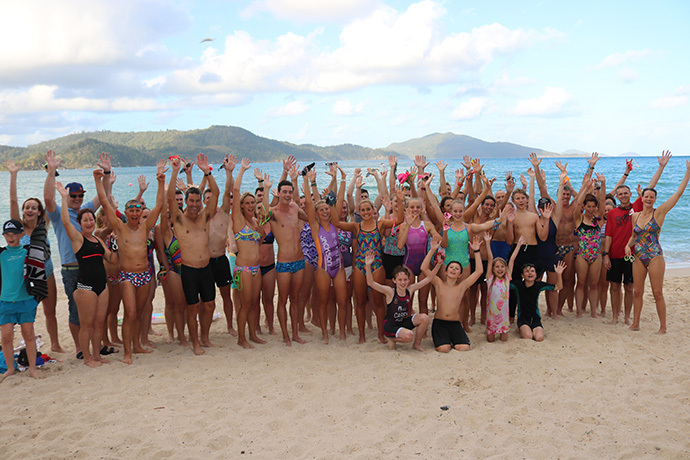 Sunday is the famous Whitehaven Beach Ocean Swim, which allows swimmers of all abilities to soak up the social atmosphere and compete on one of the top 10 beaches in the world. 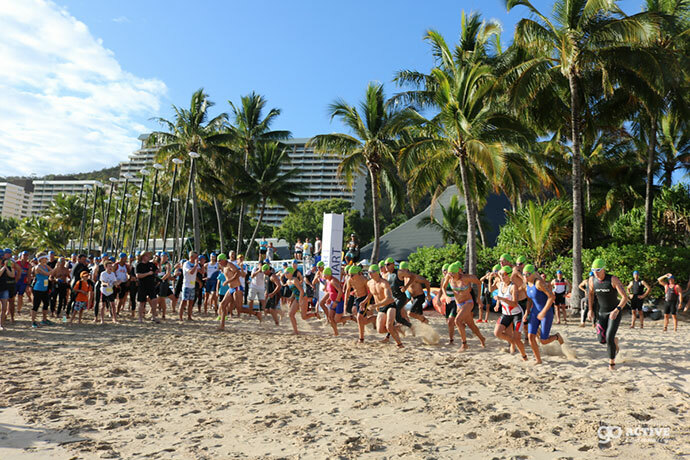 There’s a junior race, plus 750m ‘anything goes’, and the big one – 2km — all on the pristine, ‘almost-hurts-your-eyes-it’s-so-white’ beach. Earlier Sunday morning is the junior triathlon, which has various distances to suit all ages. Saturday, of course, is the main triathlon, followed by presentations in the evening, but the day before offers plenty to do as well— besides the race briefing, there’s a cycle clinic and an opportunity to do a reccy of the swim course with the Australian sporting stars mentioned above, plus hear from them later on in the ‘Carbs on the Couch’ dinner. There’s never a dull moment! This is the motto of the event and it’s certainly one of the most appealing aspects, gathering from the competitors that we chatted to. Grab your friends and family and head three hours south for an active weekend away, then reward yourself by going to dinner at the likes of Asian restaurant Coca Chu; the new Mexican place Tako; Romano’s — the Italian restaurant that was recommended to us; or for a pub meal or fish and chips. Then there are the cocktails you can have by the pool, the beach yoga overlooking neighbouring islands (this was hosted by Specialized this year as part of their Healthy Catch Ups initiative), zip around the island in one of the trademark golf buggies, enjoy a massage or day spa at the luxurious Qualia, breakfast with the Koalas, Stand Up Paddleboarding or sailing on Catseye Beach — need I go on? Whether you have kids, or you’re a couple, there is so much for the support crew to do. And — the following year — they may just get inspired to join you. 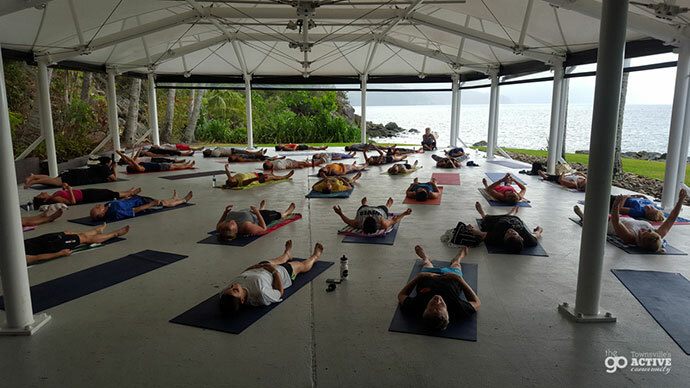 The yoga organised by Specialized as part of the Healthy Catch Ups initiative. When you go to rack your bike in transition the day before and see every spot is labelled in alphabetical order with all competitors’ names like the pros, you start to feel a bit special. Then you have the other standout aspects like having your gear all packed up for you after the race with a gift included for all competitors; the extent that staff go to in order to ensure the safety of your gear (including precious bikes) and to make sure you have a comfortable stay, and the quirky things like having catamarans on the swim course to mark the turning buoys — can’t miss them! The catamaran turning buoys stood out. 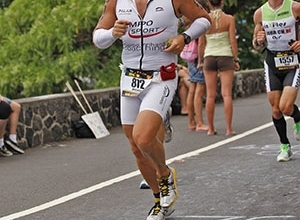 Being a sprint distance (750m swim, 20km ride, 5km run) it’s an achievable way to get into the sport. Despite the hills that make this course more challenging (and therefore ‘slower’) than many other local triathlons; it’s still a fantastic choice for your first time and there’s plenty of support to ensure everything runs smoothly. The swim at Catseye Beach is sheltered (no big waves to inhale seawater), the bike and run legs are easy-to-follow so not much chance of getting lost (you’d run out of road on the island before that happens), and although there are some steep climbs (20% gradient in one spot), you do the same bike course three times so you know what you’re in for and can pace yourself. The race has a great atmosphere with lots of supporters. Registrations open for the 2016 Fujifilm Ocean Swim and Triathlon in the first week of December, so stay tuned. 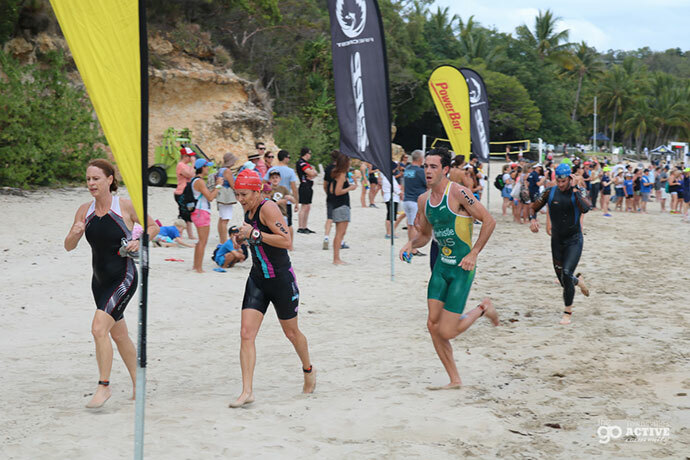 The triathlon will be on Saturday, November 12 with the Whitehaven Beach Ocean Swim on Sunday, November 13 and there are affordable packages available that give you discounted accommodation and ferry transfers with your event entry. 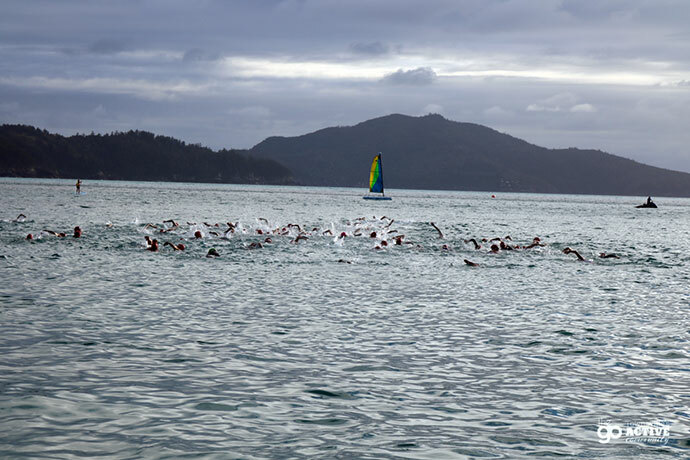 These events form part of the Hamilton Island Endurance Series, which includes the Hilly Half Marathon and Great Whitehaven Beach Run — more info about the series here: http://www.hamiltonisland.com.au/sports-events/endurance-series. 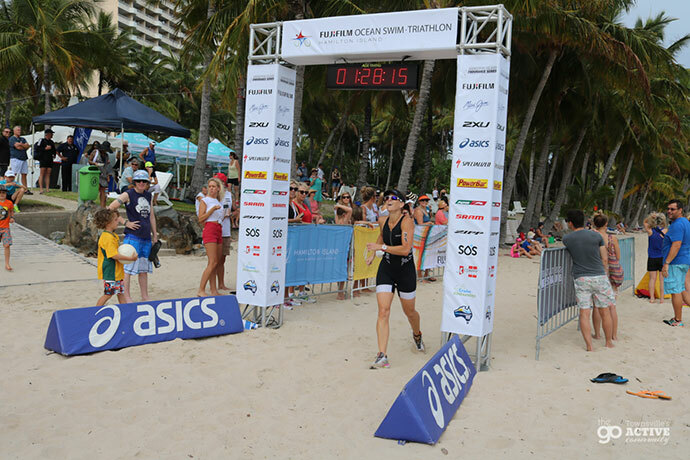 Here are the full results from the Hamilton Island Triathlon 2015 and the Whitehaven Beach Ocean Swim 2015. Well done to everyone who took part! Disclosure: The author was a guest of Hamilton Island. For more photos, check out the full album on Facebook.